The complet Set to learn slackline and balance. For kids and adults! Learn easily how to balance thanks to the "Cruise Easy Set". The webbing tighten above your head helps you to maintain your balance. Less falls = more time on the webbing, more fun. No more hard times when you're doing your firsts steps. No more falls, progress easily. Thanks to the Cruise Set Easy, you will be able to walk faster and easier on all the length of your webbing. You will also be able to play with the line's bounce. Install first the Cruise Set and then the 2,5cm webbing. Dismounting : first the 2,5cm and then the Cruise Set. Put the ratchet with the handle under the line. Head down. The tightest is the above webbing, the easiest it will be to walk on the Cruise Set. One 2,5cm webbing - 15m long with an eyeloop. Tight it above your head to help you find your balance. 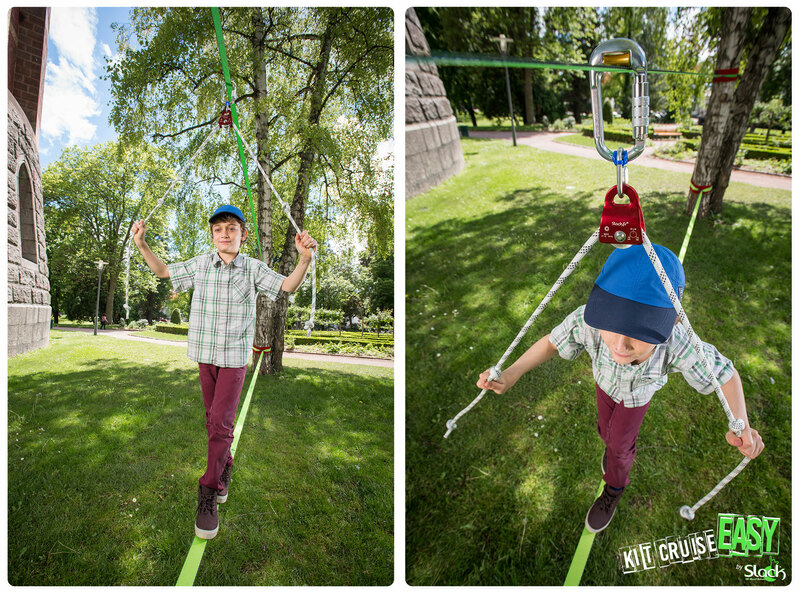 You will get all the help you need to walk your first steps on all the slackline's length. The rope is guided but move, so you will get both help and learning. Easy and intuitive set-up. Suitable for adults. Once you think you correctly handle your balance, walk without any help. The second line could then be use an another slackline. BASIC (Webbing - by default : Composed of a captive webbing with sewn handle to install on your guideline. It is the simplest solution to learn easily and economic. GLISS : The Zicral Carabiner + Rope : Composed of a zicral carabiner to slide help and follow you more easily as you progress. This aid has a rope to allow a better grip. GLISS + : Rollerbiner Carabiner + Rope : Composed of a carabiner with integrated pulley to follow you without creating discomfort and to be closer to the sensations of balance and slackline walking. The rope that allows a better grip and also mounted on a pulley to increase the difficulty. Very interesting during the learning process. Tree protections : protect both tree and equipments. They are also very useful for the set-up. See video. The 2,5cm webbing must be tight 2 meters above the Cruise Set for kids. 2,5 meters above for adults. Arms must be almost tight. Install first the Cruise Set and then the 2,5cm webbing. Dismounting : first the 2,5cm and then the Cruise Set. Don't push the ratchet too hard. One person only when using the handle. Kids are not allowed to hang directly on the above webbing. Fix it high enough. One 5cm wide webbing. Length 15m. With reinforced eyeloop. One ergonomic ratchet, for 5cm wide webbing with adapted sling (2,5m long) and reinforced eyeloop. The ratchet must be pulled by one person maximum at the time. 2 pairs because 2 lines to setup. Protect both tree and equipments.